2. Click on the 'Hiring' workflow tab. 3. Select the 'Initiate Hiring Checklist'. 4. Select the relevant candidate record. You will be prompted to input the details of the candidate if you haven't already entered these into the enableHR system. 5. Answer all questions listed in the checklist. All actions, documentation and notes captured in the process of completing the checklist will automatically be electronically stored against the candidate's worker record within enableHR. 6. Under step 7.02, you will need to state whether the candidate was successful or not. 7. If successful, you will prompted under step 8.02 to 'contact the candidate to advise them that they were successful'. If required, you can inform the candidate using our letter template. Alternatively, this step can be skipped by simply 'recording a note' if you have already advised the candidate of their success by phone, in person or via separate email. 8. You will now need to issue an employment contract to the successful candidate. This is done under step 8.03. 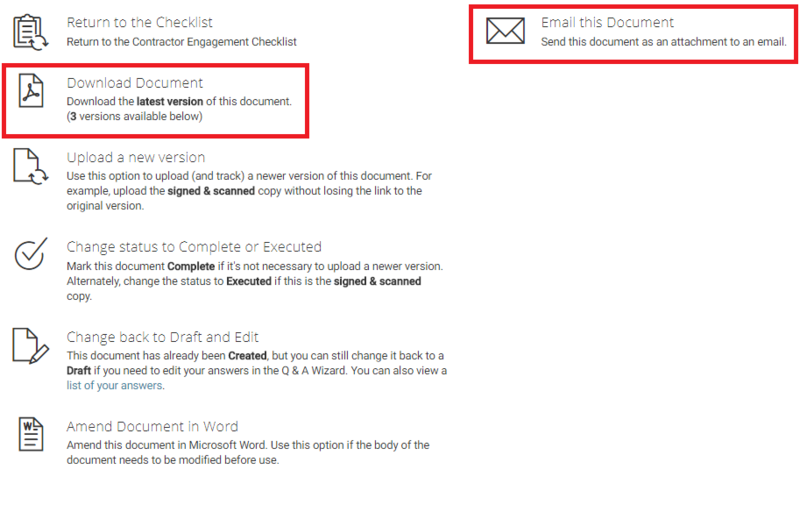 At this step, select the 'Create' button and then the 'Create a new document' button. 9. You will then be prompted to answer a series of questions. All answers input into enableHR will automatically be populated within the contract once this process is complete. The contract will also automatically source all relevant details about the candidate stored against their worker record and input them into the contract (such as name, address etc). 10. Once all answers have been completed, you can 'Preview' the contract or can simply select 'Next' in order to return to the checklist so that you can complete the remaining steps. 11. The Employment Contract is automatically stored against the checklist and the candidate's worker record. You can 'Download' or 'Email' the contract depending on your preferred communication methods. 12. Once the signed employment contract has been returned, remember to go back into the checklist and complete the remaining steps. The final most important step is under 11.04 where you will be prompted to convert the candidate record into an employee record. IMPORTANT: You can also use enableHR to manage this new employee's induction to your business. To do this you will need to select the 'Employee Management' workflow tab and then select the 'Employee Induction' checklist.